Edinburgh robotics experts are to join in an initiative that seeks to develop collaborations with industry and academia. The University is a founding member of the EPSRC UK Robotics and Autonomous Systems Network (UK-RAS Network). The initiative will seek to develop and exploit robotics and autonomous systems and to provide academic leadership in the field. Funding for the programme is provided by the Engineering and Physical Sciences Research Council. The network will seek to expand collaboration with industry, and will integrate and coordinate activities at eight dedicated facilities and Centres for Doctoral Training (CDTs) across the UK, including Edinburgh. Other founding network members include Imperial College London, Bristol Robotics Lab, Heriot-Watt University, University College London and Loughborough University. They are joined by the Universities of Leeds, Liverpool, Oxford, Sheffield, Southampton, and Warwick. 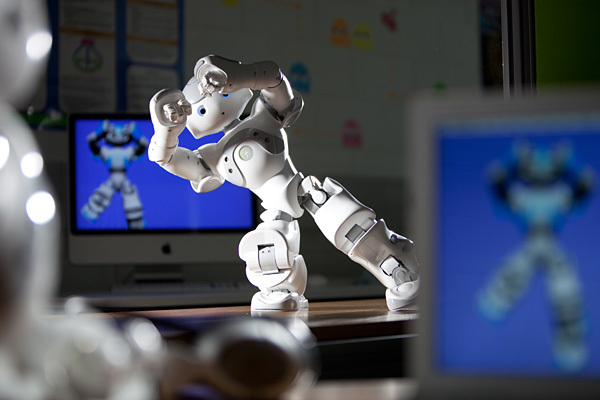 The UK’s core academic capabilities in robotics innovation are being nationally co-ordinated for the first time under the network umbrella. Academic and industry collaborations will be encouraged, to accelerate the development and adoption of robotics and autonomous systems. Industrial partners, the Science Museum and professional bodies are supporting the network. It will be expanded to include key national laboratories in the UK and international collaborators from academia and industry. The global market for service and industrial robots is estimated to reach US$59.5 billion by 2020. "This is an exciting time for robotics research, and its potential to deliver disruptive solutions in various domains and enhance our lifestyles has never been more poignant. Edinburgh aims to play a leading role in bringing about this advance by attracting world leading talent, ready to exploit the excellent ecosystem in Robotics and Autonomous System technology that we have created here."